This article will explain some games and exercises in order to teach children and adolescents the technique of discus throw in athletics. But before, a brief description of the technique and the competition of this modality: the discus throw is a competition of the athletics, where the objective is to throw a heavy object of circular section denominated disc or discus as far as possible. The discus is throwed from a circle area of 2.50 meters in diameter and must land within a sector of 35 ° angle. It is a wooden circle surrounded by metal; For men, the discus has a diameter of 22 centimeters and a weight of 2 kilograms, while for women it measures 18 centimeters and weighs 1 kilogram. It should be thrown with one hand. The test has been part of the athletics program at the Olympic Games since 1896 and the World Athletics Championships since 1983. 1. "Throw the hoop to your partner". 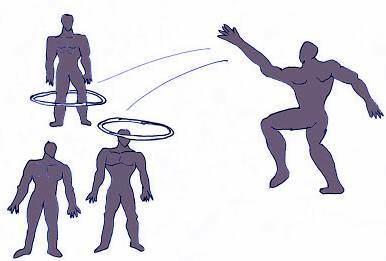 Description: After explaining some basic gestures of the disc-throwing technique, hoops are given per players pair. 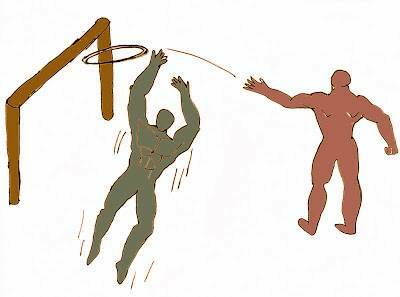 Their place separated from each other at a distance of 10 to 15 meters where they should throw the hoop trying to fall to "hugging" the partner ("choke" in the partner). The couple that accomplish this the greater number of times will win. It must be taken into account that the throwing of the ring or hoop can not be the way each player wants, but the fact of throwing it should be respected by making a lateral-medial arm movement with the palm of the hand "looking" towards the ground, and performing a slight trunk twist. 2. "Pass ten with hoop". Description: A certain number of players are located in a relatively large area (30 or more square meters). They are located by teams of equal number of players. The goal will be to complete ten consecutive passes between teammates of the same team, throwing the ring or hoop to each other. It must be taken into account that the throwing of the ring can not be the way each player wants, but the fact of throwing it should be respected by making a lateral-medial arm movement, with the palm of the hand "looking" towards the soil, and making a slight trunk twist. If a player throws the ring in another way, he will lose possession of it and his team passes will be reset. 3. "I hug the pines (teammates) with the hoop". Description: A certain number of players are located in a limited area of ​​10 or more square meters. These players must stand completely still, with something to protect their faces. Now, other players will compete individually in turns by throwing a certain amount of hoops (5, 10 or more) trying to "tuck" them in players who are standing and static in the area mentioned. The players must make the throws at a distance of 8 meters separated from the area. The player who "chokes" more hoops will be the winner. 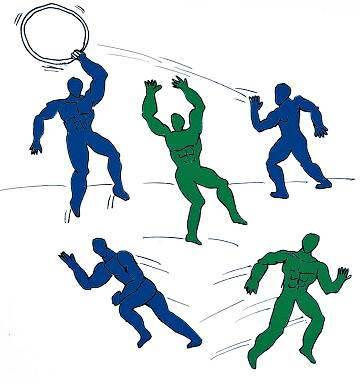 It must be taken into account that the throwing of the rings can not be the way each player wants, but should be respected the fact of throwing it making a movement of the arm of lateral-medial form, with the palm of the hand "looking" To the ground, and performing a slight trunk twist. If a player throws a ring in another way and luckily "snaps" it in any of the players, this will be an invalid throw. 4. "Throw the ring to infinity". Description: Some players are placed in a row next to each other, separated by 2-3 meters. Each will have a hoop in their possession. The goal will be to throw the hoop as far as possible, but keeping a proper throwing technique, that is to say that it must be taken into account that the throwing of the ring can not be the way each player wants, but that the fact of throwing it must be respected A lateral-medial arm movement, with the palm of the hand "looking" at the ground, and making a slight trunk twist. If a player throws the ring in another way, his throw will be invalidated and he will be disqualified. 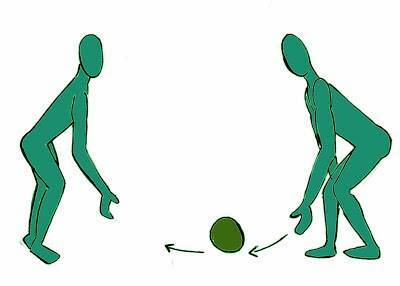 Description: Teams of equal number of players will compete to score goals by introducing a hoop in a footballl or soccer goal. There will be no goalkeeper established, but then to be able to make pitches to the goal, each team must complete at least 5 passes in a row. Then, it must be taken into account that the throwing of the hoop towards the players and towards the goal can not be the way each player wants, but that the fact of throwing it should be respected realizing a movement of the arm of form lateral-medial, with the palm of the hand "looking" towards the ground, and making a slight twist of trunk. If a player throws the ring in another way, his team passes will be invalid and they will lose possession of the ring, or the goal will be invalid. Description: A certain number of players are located in a limited area of 20 or more square meters. To the surroundings and separated of this area by 5 to 10 meters will be located some players (2 or more depending on the total number of participants) that will have a hoop in its power. The goal will be to try to strike players who are within the limited area by simply touching them with the hoop anywhere on their body. But it must be taken into account then that the throwing of the hoop towards the players can not be the way each player wants, but that the fact of throwing it should be respected realizing a movement of the arm of lateral-medial form, with the palm of the hand "looking" at the ground, and performing a slight trunk twist. 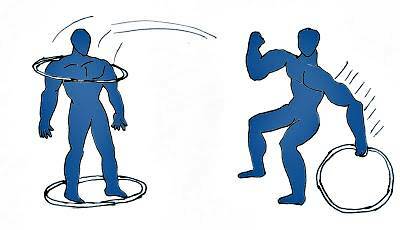 If a player throws the ring making a different throwing movement and strikes a player, the "punch" will not be valid. 7. 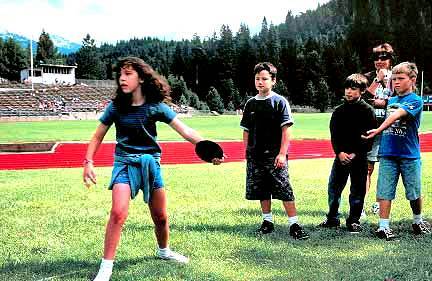 "Throw the disc high". 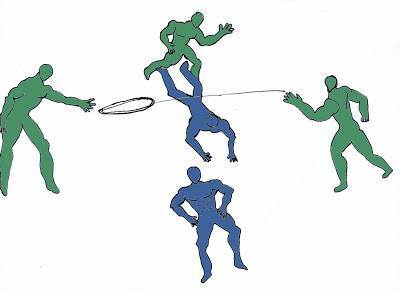 Description: Throw the discus or a device similar to a discus high and catch it with the other hand, clarify to the athletes that the discus in each launch must turn. Variant: perform the same exercise with a small race, use cones to delimit the area where the athlete made the move. Materials: Disks or objects that resemble him and cones. Description: Two partners send the discus by rolling it (pushing it with the index). At first, athletes should perform the exercise over a short distance that must then be progressively increased, as well as the speed at the time of throwing the discus to be able to generate a greater displacement of it. Materials: disks or objects similar to a discus. 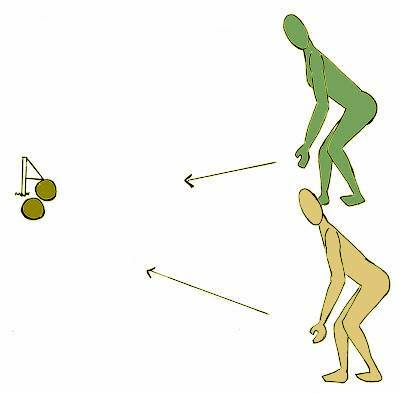 Description: Athletes are located in a line that can be delimited by cones or stops, they must throw the discus by rolling it (pushing it with the index), the person who rolls the disc wins as far as possible. Materials: disks or objects of similar shape and that can roll. 10. "Roll the disc with good aim". 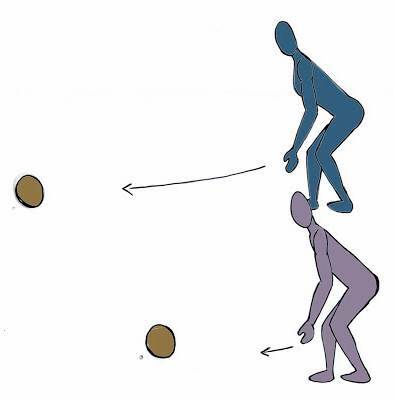 Description: Athletes are located in a line that can be delimited by cones or stops, they must throw the disc by rolling it (pushing it with the index), but now in front of them and a determined distance will be located a stake that will act as White. 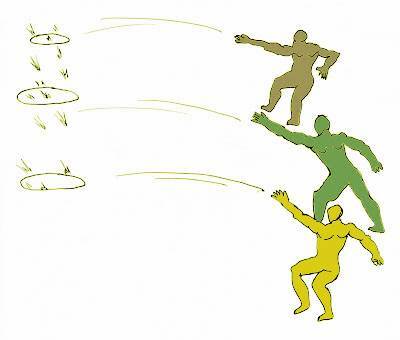 They should throw the disc as close as possible to the goal (the stake), the athlete will win or the group that gets closer. Variant: place the objective or objectives at different distances and give points to the stakes, the further the greater the score. Materials: discs or objects that resemble, cones or stops. 11. "Throw in the basket". Description: Athletes are located in a line that can be delimited by cones or stops, should throw the disc try to insert it into a bucket or a basket. Use different distances and also give points depending where the basket is located. 12. "Launching above the football goal". "Launching between some hoops located in the soccer bow". Description: The athletes are located in front of the soccer goal on the 16.50 meters and should throw the disc above the crossbar. Variant: increase or decrease the distance between the athlete and the soccer goal. Materials: disks or objects that resemble. 13. "Launching between two chords". Description: The athletes are placed in front of the soccer goal on the 16.50 meters and they must throw the disc introducing it in hoops that are hung in the goal. The person or team that manages to insert more discus in the hoops wins. Variant: give points to the different rings, example: two points for the rings of the ends and 5 points for the middle ring. Materials: disks or similar objects and hoops.